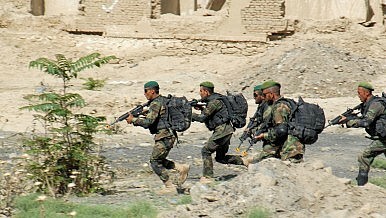 Afghan forces captured the effective second-in-command and a key tactician of the Haqqani network. Reports emerged Thursday that Afghan forces had successfully captured the son of the founder of the Haqqani network earlier this week. Anas Haqqani, the group’s second in command after Jalaluddin Haqqani, was captured on Tuesday in the eastern Afghan city of Khost. Hafiz Rashid, a commander for the terror network in southeastern Afghanistan, was also captured on Tuesday. According to Reuters, Haqqani was the group’s primary fund raiser. The Afghan National Directorate for Security (NDS) noted that Haqqani mostly focused his fund raising efforts on “individuals from Arab countries.” He additionally directed the group’s social media recruitment efforts. With Haqqani out of the picture, the network’s ability to successfully grow and fund its activities may be hindered. Rashid was in charge of “selecting targets and providing equipment for suicide bombers in Kabul,” according to Reuters. Afghan officials further cite Rashid as the central planner of the group’s suicide attacks. “We hope that these two arrests will have direct consequences on the network and their centre of command,” NDS spokesman Haseeb Sediqi noted. The network has attacked a variety of foreign targets in Afghanistan in the past including various hotels, the U.S. embassy, NATO supply convoys, and the Indian embassy. U.S. officials believe that the group operates out of Pakistan’s Waziristan tribal region, which borders Afghanistan. The United States has established a special unit based in Afghanistan to counter the group’s planned attacks, Reuters reports. The Afghan National Unity Government’s ‘China Card’ Approach to Pakistan: Part 2The ‘Father of the Taliban’ Is Dead. What Does That Mean for the Afghan Peace Process?Pakistan’s Catch-22 MomentTaliban Announce Death of Jalaluddin Haqqani, Founder of the Haqqani NetworkAre We Finally Seeing a Breakthrough in Afghanistan-Pakistan Relations?